BARSTOW, Calif. -- A severely emaciated dog with gunshot wounds to his paws was rescued from the desert in Barstow after officials said he was left there to die. The dog, now named Vernon since he was found near Vernon's Truck Wash, was spotted by a Good Samaritan on Saturday. When first discovered, Vernon was extremely thin and dehydrated and couldn't walk on his severely injured paws. 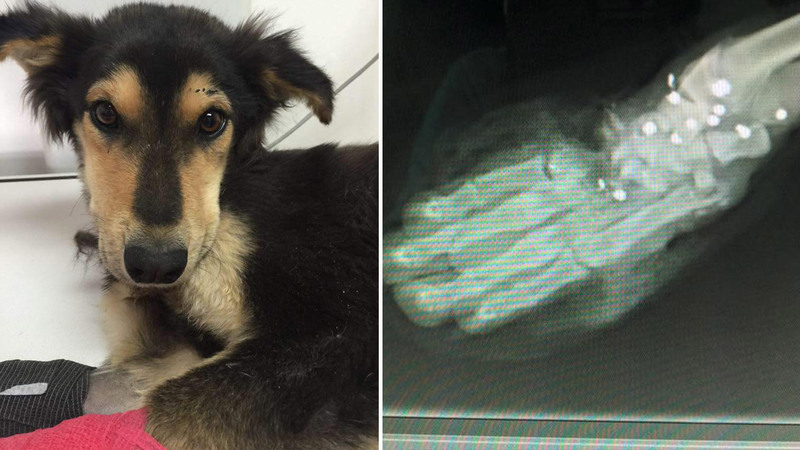 X-rays revealed shotgun pellets in both paws and also in other parts of his body. The veterinarian who helped Vernon believed the dog was intentionally shot and left to die in the desert. Now the veterinarian hopes Vernon's paws can be saved. The Barstow Humane Society has offered a $500 reward for information leading to the person responsible for Vernon's injuries and abandonment. If you'd like to learn how you can help with Vernon's medical cost, click here for more information.